Provide comfort for the family of Kathaleen Smith with a meaningful gesture of sympathy. 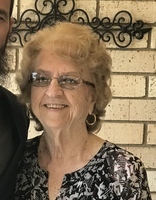 Garden City- Kathaleen Jo Smith, 81, died on Monday, February 4, 2019 at her home in Garden City. She was born on June 8, 1937 at Garden City the daughter of Joseph & Nora (Cook) Zubeck. She married Rex Porter. She later married Larry Robert Smith on April 23, 1994 at Plymell. She is survived by her Husband- Larry Smith of the Home, Son- Kenneth Porter of Shawnee Mission, 3 Daughters- Jana Rogers, Nancy Porter & Kayla Dreiling all of Garden City, 3 Step-Sons- Troy Smith of St Augustine, Florida, Terry Smith of Roanoke, Virginia & Ty Smith of Statesville, North Carolina, Sister- Patsy Brimm of Garden City, 15 Grandchildren, 20 Great-Grandchildren & 1 Great-Great-Grandson. Funeral Service will be at 10:30 AM Saturday at First Assembly Of God Church with Rev Nathan Sheridan and Rev John Hubbard officiating. Burial will be in Deerfield Cemetery. Memorials are suggested to First Assembly Of God Church in care of Garnand Funeral Home. Condolences may be posted at www.garnandfuneralhomes.com. To plant a memorial tree in honor of Kathaleen Jo Smith, please visit our Heartfelt Sympathies Store. We encourage you to share your most beloved memories of Kathaleen here, so that the family and other loved ones can always see it. You can upload cherished photographs, or share your favorite stories, and can even comment on those shared by others.